Schools | Malik The Magic Guy! Top New England Comedy Magician Boston Massachusetts and New England Magician Malik the Magic Guy. Malik's magic is great for schools! If your goal is to educate your students with an en engaging and entertaining assembly program, Malik offers programs on the topics of reading, anti-bullying, and personal responsibility. 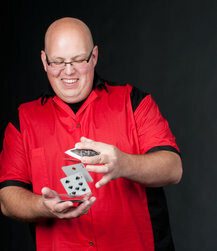 Magic shows can also be a great way to raise funds for your school, club, or organization. Malik's fundraiser program is guaranteed to result in profits for your group. "We recently hosted Malik the Magic Guy at our local summer camp. Malik's show was such a wonderful experience for our campers! He was extremely engaging and established an immediate rapport with our young audience. Our group was impressed with Malik's magical talent and spoke of his show for days to come! He was extremely easy to contact, was very flexible and accommodating with his schedule and most importantly---provided an age appropriate show for our group of twenty campers (aged 4-7). We hope to work with him again in the future!"